AddDrawingHandler Adds a drawing handler to the end. AddEventHandler Adds an event handler. AddFieldType Adds a field type. AddHandler Adds a file handler to the end. AddParagraph Convenience function to add a paragraph of text. BatchingUndo Returns True if we are collapsing commands. BeginBatchUndo Begin collapsing undo/redo commands. BeginCharacterStyle Begins named character style. BeginFont Begins using this font. BeginFontSize Begins using point size. BeginLeftIndent Begins using leftIndent for the left indent, and optionally leftSubIndent for the sub-indent. BeginLineSpacing Begins line spacing using the specified value. BeginListStyle Begins named list style. BeginParagraphSpacing Begins paragraph spacing; pass the before-paragraph and after-paragraph spacing in tenths of a millimetre. BeginParagraphStyle Begins named paragraph style. BeginRightIndent Begins a right indent, specified in tenths of a millimetre. BeginStandardBullet Begins applying a standard bullet, using one of the standard bullet names (currently standard/circle or standard/square . BeginStyle Begin using a style. BeginSuppressUndo Begin suppressing undo/redo commands. BeginSymbolBullet Begins applying a symbol bullet, using a character from the current font. BeginTextColour Begins using this colour. BeginURL Begins applying wx.TEXT_ATTR_URL to the content. CanPasteFromClipboard Returns True if we can paste from the clipboard. CleanUpDrawingHandlers Clean up drawing handlers. CleanUpFieldTypes Cleans up field types. CleanUpHandlers Clean up file handlers. ClearStyleStack Clears the style stack. CopyToClipboard Copy the range to the clipboard. DeleteRangeWithUndo Submits a command to delete this range. EndBatchUndo End collapsing undo/redo commands. EndCharacterStyle Ends named character style. EndFont Ends using a font. EndFontSize Ends using point size. EndListStyle Ends named character style. EndParagraphStyle Ends named character style. EndSuppressUndo End suppressing undo/redo commands. EndTextColour Ends using a colour. FindDrawingHandler Finds a drawing handler by name. FindFieldType Finds a field type by name. FindHandlerByType Finds a handler by type. FindHandlerByExtension Finds a file handler by extension and type. FindHandlerByName Finds a file handler by name. FindHandlerByFilename Finds a handler by filename or, if supplied, type. GetBatchedCommand Returns the collapsed command. GetBulletProportion Returns the factor to multiply by character height to get a reasonable bullet size. GetBulletRightMargin Returns the minimum margin between bullet and paragraph in 10ths of a mm. GetCommandProcessor Returns the command processor. GetDimensionScale Returns the scale factor for displaying certain dimensions such as indentation and inter-paragraph spacing. GetDrawingHandlers Returns the drawing handlers. GetFloatingLayoutMode Returns the floating layout mode. GetFontScale Returns the scale factor for displaying fonts, for example for more comfortable editing. GetFontTable Returns the table storing fonts, for quick access and font reuse. GetHandlerFlags Gets the handler flags, controlling loading and saving. GetHandlers Returns the file handlers. GetRenderer Returns the renderer object. GetScale Returns the scale factor for calculating dimensions. GetStyleSheet Returns the style sheet. GetStyleStackSize Returns the size of the style stack, for example to check correct nesting. HitTest Hit-testing: returns a flag indicating hit test details, plus information about position. InitStandardHandlers Initialise the standard file handlers. InsertDrawingHandler Inserts a drawing handler at the front. InsertHandler Inserts a file handler at the front. InsertImageWithUndo Submits a command to insert the given image. InsertNewlineWithUndo Submits a command to insert a newline. InsertObjectWithUndo Submits a command to insert an object. InsertParagraphsWithUndo Submits a command to insert paragraphs. InsertTextWithUndo Submits a command to insert the given text. IsModified Returns True if the buffer was modified. LoadFile Loads content from a stream or file. PasteFromClipboard Paste the clipboard content to the buffer. PopStyleSheet Pops the style sheet from the top of the style sheet stack. PushStyleSheet Pushes the style sheet to the top of the style sheet stack. RemoveDrawingHandler Removes a drawing handler. RemoveEventHandler Removes an event handler from the buffer’s list of handlers, deleting the object if deleteHandler is True. RemoveFieldType Removes a field type by name. RemoveHandler Removes a file handler. ResetAndClearCommands Clears the buffer, adds an empty paragraph, and clears the command processor. SaveFile Saves content to a stream or file. SendEvent Send event to event handlers. SetBulletProportion Sets the factor to multiply by character height to get a reasonable bullet size. SetBulletRightMargin Sets the minimum margin between bullet and paragraph in 10ths of a mm. SetDimensionScale Sets the scale factor for displaying certain dimensions such as indentation and inter-paragraph spacing. SetFloatingLayoutMode Sets the floating layout mode. SetFontScale Sets the scale factor for displaying fonts, for example for more comfortable editing. SetFontTable Sets table storing fonts, for quick access and font reuse. SetHandlerFlags Sets the handler flags, controlling loading and saving. SetRenderer Sets renderer as the object to be used to render certain aspects of the content, such as bullets. SetScale Sets the scale factor for calculating dimensions. SetStyleSheet Sets style sheet, if any. SetStyleSheetAndNotify Sets the style sheet and sends a notification of the change. SubmitAction Submit the action immediately, or delay according to whether collapsing is on. SuppressingUndo Are we suppressing undo?? The buffer never deletes any of the event handlers, unless RemoveEventHandler is called with True as the second argument. spacing is a multiple, where 10 means single-spacing, 15 means 1.5 spacing, and 20 means float spacing. The wx.TextAttrLineSpacing enumeration values are defined for convenience. 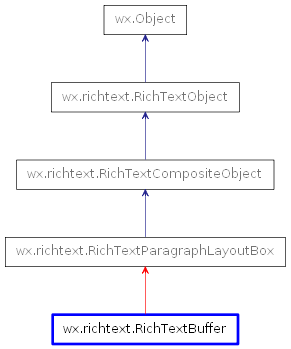 wx.richtext.RichTextBuffer uses indentation to render a bulleted item. The left indent is the distance between the margin and the bullet. The content of the paragraph, including the first line, starts at leftMargin + leftSubIndent. So the distance between the left edge of the bullet and the left of the actual paragraph is leftSubIndent. Begins applying a standard bullet, using one of the standard bullet names (currently standard/circle or standard/square . See BeginNumberedBullet for an explanation of how indentation is used to render the bulleted paragraph. Begins applying wx.TEXT_ATTR_URL to the content. Gets a wildcard string for the file dialog based on all the currently loaded richtext file handlers, and a list that can be used to map those filter types to the file handler type. contextObj is returned to specify what object position is relevant to, since otherwise there’s an ambiguity. @ obj might not be a child of contextObj, since we may be referring to the container itself if we have no hit on a child - for example if we click outside an object. Removes an event handler from the buffer’s list of handlers, deleting the object if deleteHandler is True. You can override default rendering by deriving a new class from wx.richtext.RichTextRenderer or wx.richtext.RichTextStdRenderer, overriding one or more virtual functions, and setting an instance of the class using this function.